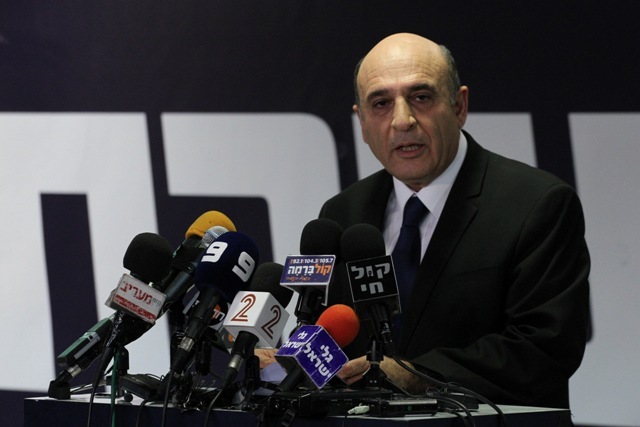 (Tiberias, Israel)—Shaul Mofaz quit the Netanyahu government here in Israel last night, taking his Kadima party back into the opposition. The move comes just 10 weeks after Mofaz had struck a deal with Prime Minister Netanyahu to join the government. Mofaz said he was quitting his position as Vice Prime Minister because he and Netanyahu had failed to negotiate a compromise over legislation that would require Ultra-Orthodox Jews and Israeli Arabs to serve in the army (or in some form of national service, such as serving in police or fire units) like all other Israeli young people must do. There is tremendous and growing resentment in Israel among secular and traditional Jews because Ultra-Orthodox youths currently aren’t required to be drafted and thus serve the needs of the nation, but rather get government stipends to study religion and additional stipends when they get married and have children. Netanyahu responded by saying he was sorry Kadima chose to leave the government, reported the Times . “We were very close to a significant change in the distribution of the national burden,” he said in a letter. “I explained to you that the only way to implement this in the field would be gradually and without tearing the Israeli society apart, especially during a period of time in which Israel finds itself in in front of many significant challenges. I will continue to work to create a responsible solution Israeli society expects.” Netanyahu wants to phase in the new reforms by allowing the Ultra-Orthodox to attend religious schools first and not get drafted until they are 23 or 26 years old, rather than be drafted at the age of 18 like all other Israelis. Several key members of Kadima sharply disagreed with Mofaz’s move, saying the party should remain in the government to keep working on a compromise. The “Tal Law” which exempts the Ultra-Orthodox and Arabs from army service expires on August 1st. Some Kadima members, and political analysts, believe Mofaz decision could effectively destroy the party, which is already bleeding public support. With Kadima out of the government, Netanyahu’s government still retains a healthy majority of 12 seats in the Knesset. But this upheaval could lead to new elections by the end of the year, or possibly in early 2013. It could also complicate the PM’s decision to launch a preemptive strike against Iran’s nuclear facilities. I believe Netanyahu is seriously considering a strike against Iran this fall, before the U.S. elections. But if his governing coalition falls apart, or if his approval ratings drop significantly, this could impede his ability to garner domestic Israeli support for such a strike.